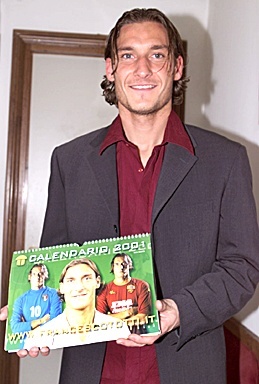 Unfortunately, the Totti gallery 5 was deleted by BOL ( BrasilOnLine ) where it was hosted. So it will not be available. However, the following galleries are available and you can see them clicking on links below. Excuse us for any incovenient. Date Of Birth: September, 27, 1976. * was born at Porta Metronia (Roma), near to the St-Jean-de-Latran basilica. Fiorella and Lorenzo are his parents. He has two older brothers: Lorenzo and Paolo. * started to walk with 9 months and already it played with ball (that, at this time, was by plastic). Sometimes, he slept with the ball. * when was child, was blond,thin and small, the minor of all. * his greatest ambition is to win titles. * thinks it's a little bit to early to get married. * like girls with dark hair and dark skin, bronzing. * affirms that when he is with his girl, he forgets all the problems, difficulties, controversies and of everything. He comes back to be a normal boy. * doesn't interest for politics, although to know that it is very important, is part of the daily life. But Totti thinks that the used language for the parliamentarians is very difficult to be understanding. But exactly thus, he always votes, cause he thinks that it is his duty. * wants to dedicate the title to, if Roma win the League, the critics about him. And he's not talking football. * if he was Italy coach, he'll put in his up front the strikers Vincenzo Montella and Pippo Inzaghi. * don't uses the internet a lot. He doesn't have much time for it. * after matches tries to relax as much as possible and tries to go home and stay with the friends and the girlfriend. * is very religious and thankful the God for being a luck youngster, calm, that works, has a family and is happy.